A consensus is emerging on the distinction between “platform capitalism” and “platform cooperativism”. The former is just old capitalism – private ownership of means of production and their operation for profit – though applied to state-of-the-art digital platforms rather than classical firms. The latter is an attempt to bring to the world of the platform the principles of the traditional cooperative movement – shared, collective ownership. All agree that two of the most high-profile platforms of the day – Airbnb and Uber – belong to platform capitalism. 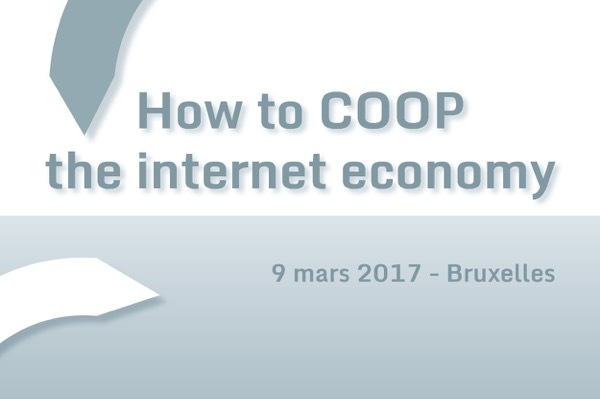 A curious terminological divide: while Dutch- and English-speakers talk about the “sharing economy” and start from consumers (and their changing behaviors) to define it, French speakers rather talk about “collaborative economy” and take producers / workers as starting points in their definitions. Just a coincidence or a more fundamental disagreement? Not sure yet. Be that as it may, all converge on excluding Airbnb and Uber from their definitions – whether they focus on “sharing” or “collaboration”. Whether we call it “sharing” or “collaborative” economy, its global impact is not always as positive as its promoters claim. Koen Frenken of the University of Utrecht showed that if its economic effects are overall positive, environmental ones are mixed and social effects are rather negative. Cities, not states, are the relevant level of governance for the sharing/collaborative economy (however defined). “Sharing cities” are the new hype and have almost replaced the “smart cities” in public discourse. This raises new hopes: Michel Bawens, leader of the P2P foundation, fascinatingly talked of alliances of cities as the new solution to bridge the local and the global, by-passing the return of the nation-state that is at the heart of recent populism, both right-wing and left-wing. Yet focus on cities risks exacerbating the urban – rural divide, noticed philosopher Edouard Delruelle of the University of Liège – all the more worrying as geographical inequalities seem to have played a major role precisely in the emergence of populism (Brexit vote, Trump’s election). For platform cooperativism to emerge in this world, Trebor Scholz of the New School and one of the initiators of the movement, insists on the importance of developing new narratives – telling convincing stories, just as Airbnb (the common “enemy”?) has done to impose itself. The Twitter network (ties = retweets and mentions) of participants to the event (hashtag “#howtocoop”). Most of today’s digital platforms, whether capitalist or not, are unprofitable today. Think of Twitter, which after over ten years of activity, is still making huge losses; and so do others. Yet major capitalist platforms have managed to attract sufficient venture capital to stay afloat; this is often more difficult for platforms in the cooperative mode, which struggle more to attract funding. Several representatives of cooperatives shared their experience with the audience: public money is increasingly scarce and private investors often want them to provide evidence of sustainability too early, while real results are more likely to be visible in the longer run. The new notion of an “open coop” is exciting, and seems most adapted to the world of the platform: but it is still very unclear. The basic idea is to go beyond the basic notion of shared ownership within a group, and develop a true culture of the commons, with an opening to outsiders. So for example, the assets of the cooperative would be the property of its members, but some of them (especially immaterial ones such as code and data) can be made available openly to all. But this is often difficult to do, for example to maintain the privacy of data subjects. More seriously, it is sometimes difficult to draw a dividing line between what can and what cannot be shared, and the boundaries between the “open” and “classical” coop are often blurred. There are challenges for both capitalist and cooperative platforms. Transformations of labor (prevalence of piecemeal work, freelancing, multiplicity of employers) are a distinctive characteristic of the digital world and concern all its actors. So do issues related to data (privacy, confidentiality, transparency…). A lot still needs to be done – in definitional, theoretical terms as well as in terms of concrete experiences and collection of empirical evidence. This was anyway a good first step in this direction. Update (30 March 2016): This post has been republished on the blog of the P2P Foundation.